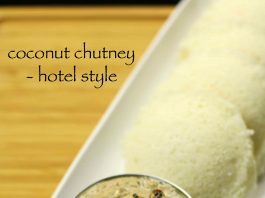 hotel style coconut chutney recipe for dosa and idli with detailed photo recipe. chutneys are great condiments / dip for south indian breakfast and snack recipes. 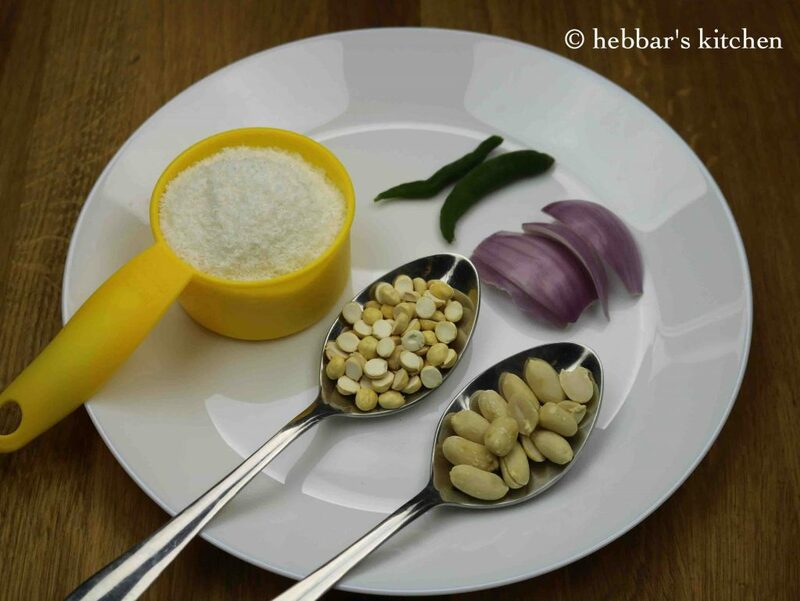 hotel style coconut chutney recipe for dosa and idli with step by step photo recipe. 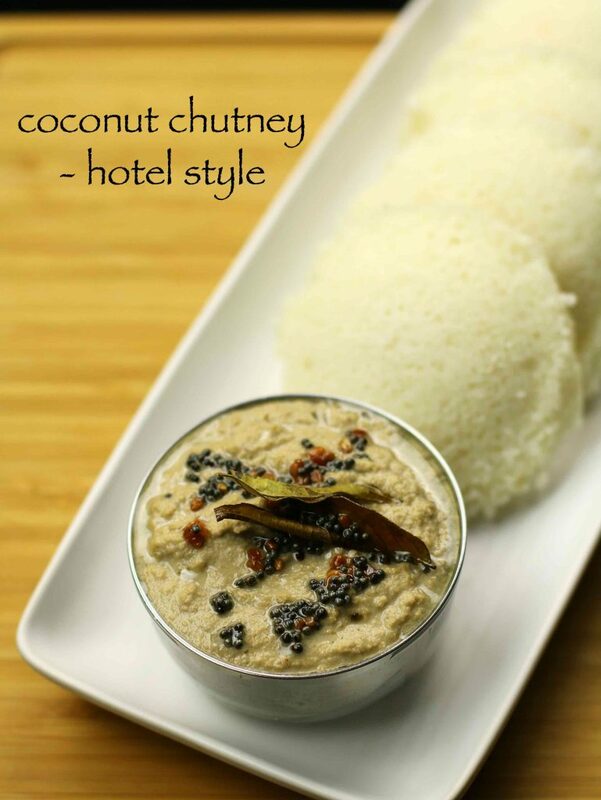 basically, simple coconut chutney is prepared with just coconut. however, restaurant style coconut chutneys are slightly different. in this style of recipe, groundnut and roasted chana dal are added with coconut. consequently, a smooth and creamy texture of chutney is produced. these are amazing side dish for any south indian breakfast. restaurant style chutneys are always my husbands favourite. few restaurants, serve it in very watery consistency. where as, few others serve it very thick and creamy. interestingly, the main reason for adding groundnut / roasted chana dal along with coconut is to increase the quantity of chutney. preparing chutney with just coconut makes it very expensive, hence to cut down the cost they add peanuts. but no doubt, the chutney turns to be very tasty and different than normal coconut chutney. 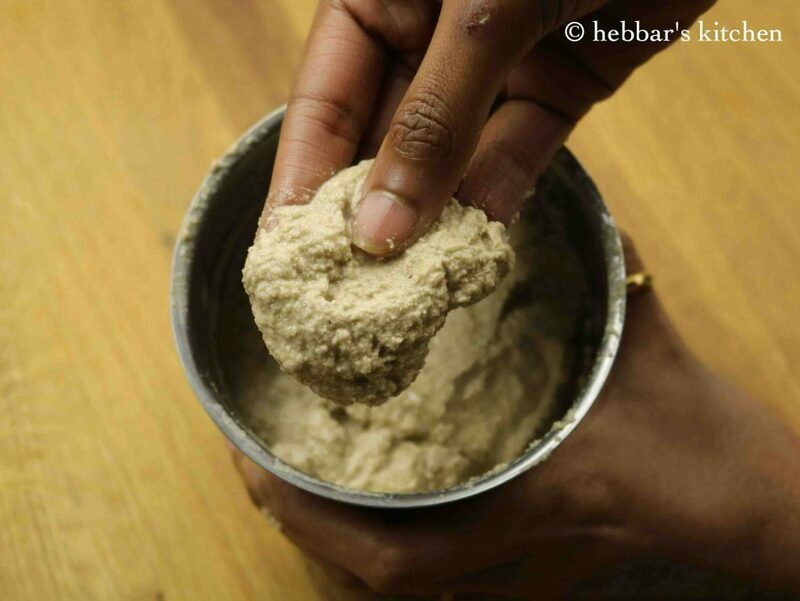 my mom prepares worlds simplest coconut chutney served for dosa and idlis. moreover, i prefer the plain coconut chutney prepared by her. she uses fresh coconut and it turns out to be very juicy and flavourful. however, we do not get the fresh coconut here in australia. hence, i use desiccated coconut for all coconut based curries. i have prepared most of the chutney’s with desiccated coconut powder. especially, capsicum chutney, chana dal chutney, tomato onion chutney. finally, i am not a big fan of chutney recipes. the chutneys are always prepared by my husband. 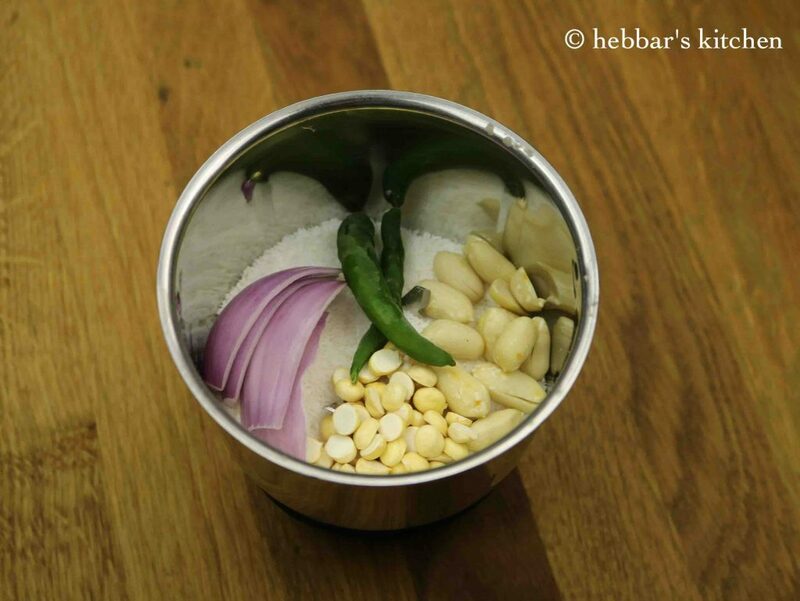 i make sure hotel style sambar is prepared whenever i prepare dosa and idli recipes. 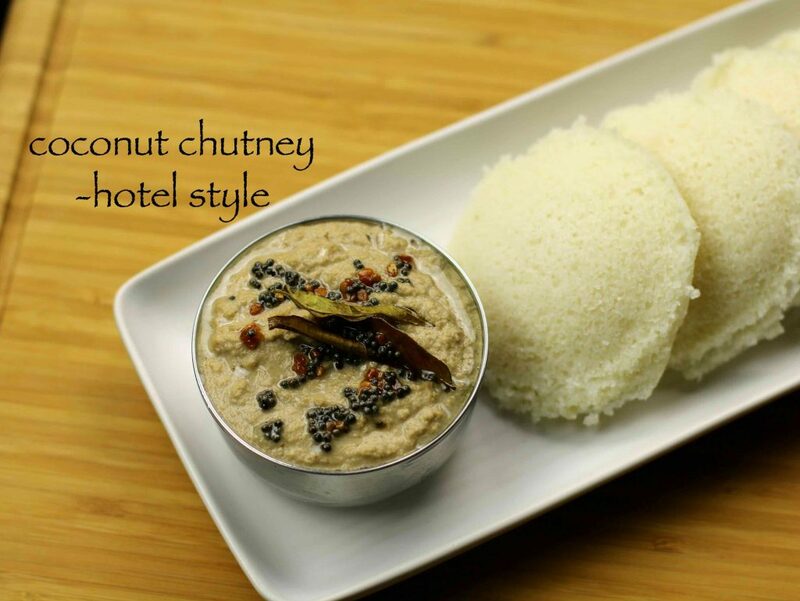 specifically, restaurant style chutney goes well with bread idli, poha idli, rava idli and stuffed idli. also try out with dosas. especially, plain dosa, masala dosa and rava dosa. firstly, keep all the grinding ingredients ready. 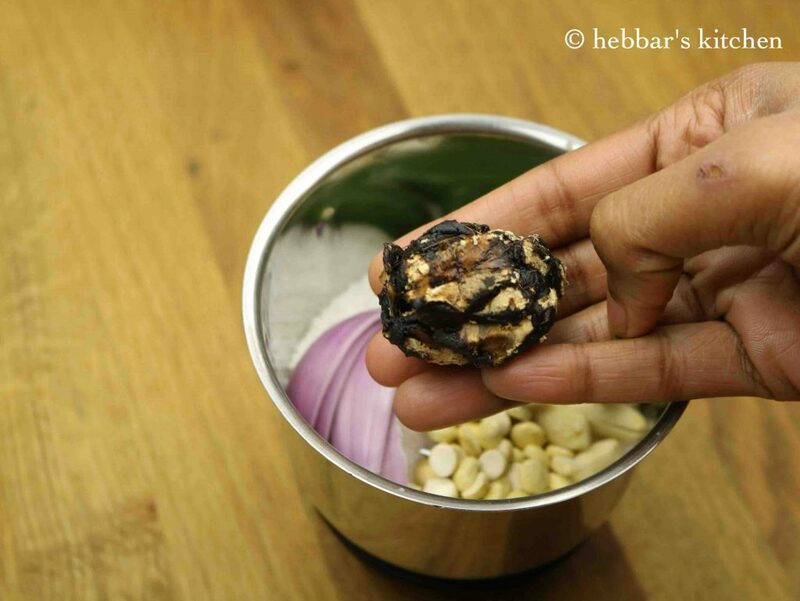 take coconut, roasted chana dal, peanuts, onions and chilli. furthermore, transfer to a small blender. also add a small piece of tamarind. additionally, add salt to taste. then add hot water as required and blend to smooth cream texture. finally, add tempering and serve with idlis and dosas. firstly, keep all the grinding ingredients ready. take coconut, roasted chana dal, roasted peanuts, onions and chilli. finally, add tempering and serve with dosa and idli. firstly, using hot water gives nice creamy texture. furthermore, blend to smooth to enjoy the real taste of chutney. additionally, add a piece of ginger as a variant. finally, tempering is optional, however, it adds great flavour. Won’t small lemon sized tamarind be too much for 1/2 cup coconut and 2 green chillies.Wouldn’t it turn too sour.According to me a small piece should be enough. Hi Archana, don’t we have to fry onions before grinding? Can we add coriander leaves for ur tasty chutney recipe….?? I never know about adding tamarind and onion to the coconut chutney recipe (I used to add, 1 clove of garlic or ginger or coriander so far and make three different chutney everytime). I will certainly try it out and see. Thank you for the wonderful demos and details. You guys are awesome! U r simply superb archana…..u make cooking so easy..
Archana thank you for teaching and leading me through Indian cookery! 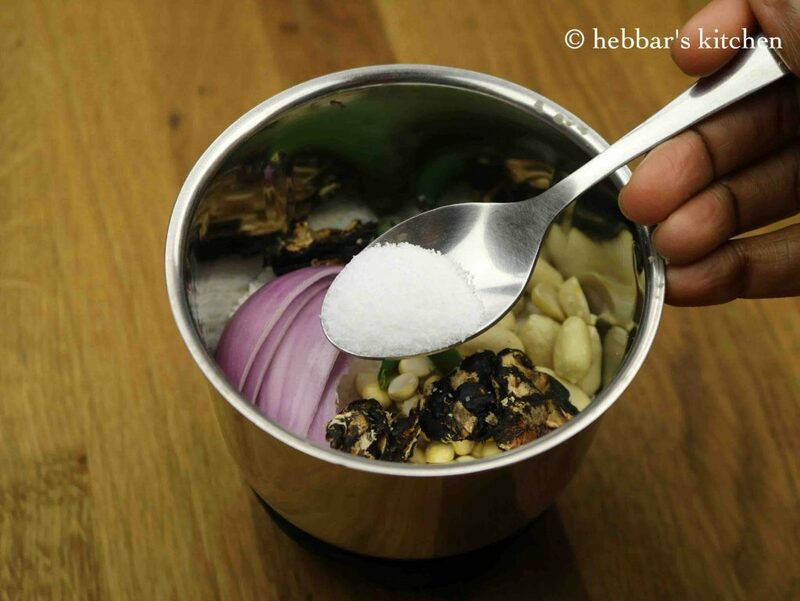 I love cooking however Indian cooking seem to intimidate me until I was introduced to Hebbar’s Kitchen! I am an avid follower as are my three daughters (2 in college, who absolutely say you are heaven sent! And 1 working and living independently) your recipes and videos are very well put together….. and I especially appreciate that you take the time to give your followers substitutions as well as options to follow. Keep up the great work and do not ever stop… God bless you and your husband! You are an Amazing blend of recipe Hebbars Kitchen.. I may not get time to try all, but Just watching your so simply defined recipe videos and photos is a favorite time pass for me. no curd for coconut chutney. add lime juice instead. Thank you very much Pri. Hot Water … Normally we are used to normal or cold water .. wont hot water spoil th etaste? hot water is used so that coconut does not release its oil. if you are using fresh coconut, than normal water should be good. Never knew this tip. Awesome, thanks! Your recipies are excellent and a real guide in kitchen . Sincere thanks to you . Your recipes are excellent,easy,time saving,even bachelor’s can prepare,i sent some to my son who stays alone . God bless you. The Ground nuts should be dry roasted and peeled before grinding. Otherwise they give a raw flavor. yes you are correct. I have clearly mentioned about it in the recipe card and also in the steps.